This is a really good episode. It's got some pretty emotional scenes of the men missing their families, and when Jack is killed. I love the pictures you have here, from that episode! I love this episode! It must have been so hard on the family, especially Caroline, with Charles going who knows where, for who knows how long, with no way of contacting him except an occasional letter. I feel bad for Charles telling Jack's family the news, and his poor wife and son :( And it's so happy to see the other man (whose name escapes me at the moment) meet his wife and new son, and of course, when Charles returns home. I agree with Rhonda, nothing beats season 1! I liked this episode, though it's not one of my favorites. 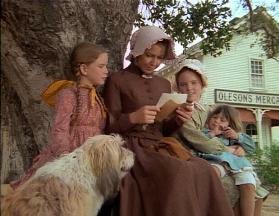 I was sad when the Ingalls family lost their crop but I was happy when Charles made two friends while walking to look for work! I was sad when Charles's friend, I don't remember his name, died in the explosion where the men were working. I like how the women, on the whole, are willing to try to save part of the crop because they know that they'll need whatever they can get. 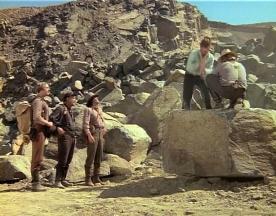 The quarry is an interesting place to choose to have Charles work... when I was watching this episode my brother walked through and commented that they really seemed to enjoy using dynamite in the series! this is a emotional roller coaster to watch....again a gambit of emotions in one episode...i can feel Charles pain when he talks to Jacks lad ....we see a young lad swallow his pain and be brave..it broke Charles heart to watch. Great supporting cast. Jack was great! 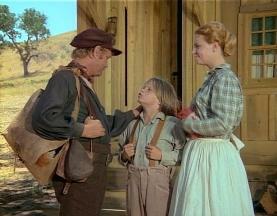 Lance Kerwin as the boy-remember him? "James at 16?" I am showing my age! I remember JAMES AT 16! Although I think I only remember one episode, something about James trying to empathize with a deaf boy, so he wore earplugs or something all day. But, back to LHOP.....I really like this episode. Although it is sad that Jack dies, I like it because it is so shocking and therefore helps add something to this episode, especially with the fear his wife had of him doing this "powder monkey" work. And I think the scene when Pa takes Jack's belongings and salary to his family is really a good scene. I'm watching this episode again tonight. Doesn't over $2,000 seem like a lot of money (for back then) that the Ingalls family would have made if that wheat crop would not have been ruined by the hail? Does anyone know if that would be a realistic amount of money for them to have made? 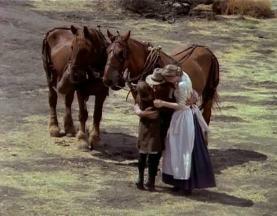 My nieces got me re-watch LHOTP. (I probably skip the episodes, I don't care for.) I just want watch up to Season 5. I didn't care for the later seasons. Back to !00 Miles. I love the Scripture, that Caroline mention about Ruth. Does anyone know what Chapter that is in the book of Ruth? I love this Episode. The ladies helping out. I'll love go to town, get the mail. Now, we get mail by our front door. I got a question. 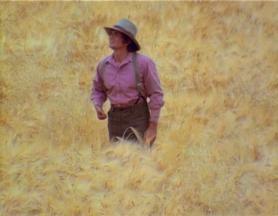 How come Charles, didn't check the wheat field after the hail storm? To see, if the wheat was still good or not. This is my 500 posts. I'm drawing a blank about which scripture Caroline quoted there. Can you refresh my memory? What were some of the words? And congratulations on your 500th post!! OH! It's a paraphrase of Ruth 2:17. "So she gleaned in the field until even and beat out that she had gleaned" is the verse. Caroline just left out a few words. Thank you, so much. I think, she said the whole scripture. I remember hearing the whole verse. 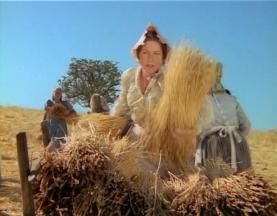 I think that there was not enough good wheat to make the harvest successful to provide for all the needs of the families. I think what Caroline and the other women did was just to salvage what remained, which was helpful, but probably not enough like what would have happened if there was a normal wheat crop. She left out "in the field". I only know because I checked my DVDs earlier today to hear what verse she'd referenced. I think what the women did was good.They tired and worked so hard.